Tyler Insurance & Commercial Litigation Attorneys | East Texas Oil & Gas Lawyers | The Parker Firm, P.C. 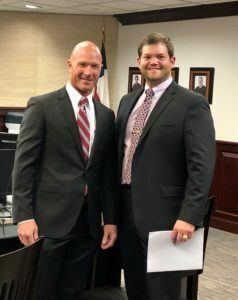 The bulk of the firm’s practice engages in a vigorous personal injury trial practice, representing plaintiffs and defendants in cases arising from truck crashes, automobile collisions, and other motor vehicle accidents. Several of our lawyers have been Board Certified in Personal Injury Trial Law by the Texas Board of Legal Specialization, giving us the expertise to handle even the most complex cases in this area. For more information, see the 18-wheeler and auto accidents page. The Parker Firm also focuses on oil and gas litigation in the many counties throughout East Texas. Whether dealing with liability questions involving oilfield accidents, construction defects, or unsafe premises causing injury. Our attorneys possess the knowledge and skill to see virtually any case through to a successful resolution. See our oil and gas page for more details. We understand that commercial disputes are an unavoidable fact of doing business, but also realize the importance of resolving those disputes efficiently. Our commercial litigation practice touches upon every aspect of business dealings, including contract disputes and business torts, including but not limited to, matters involving The Deceptive Trade Practices Act. The Parker Firm also handles matters involving construction defects. Our attorneys are knowledgeable and highly skilled in the representation of contractors, general contractors and other vendors involving construction defects causing injury. For skilled and experienced trial lawyers who understand what it takes to achieve success at the negotiating table and in the courtroom, contact The Parker Firm P.C. today.